A type of visceral film exists that is aware of its own structure. Cavalcade is one of them, it might be the first one, and it won Best Picture at the 3rd Academy Awards. The voters probably noticed it and wished to confer upon it a nod of appreciation for a book like handling of a character driven slice-of-life drama. It isn’t even an odd choice, considering talking film was still forming as a process, that a film that took advantage of large sets and big, blocky characters would win an honor that meant, probably, technical achievement in filmmaking as much as it did representation of the human experience. 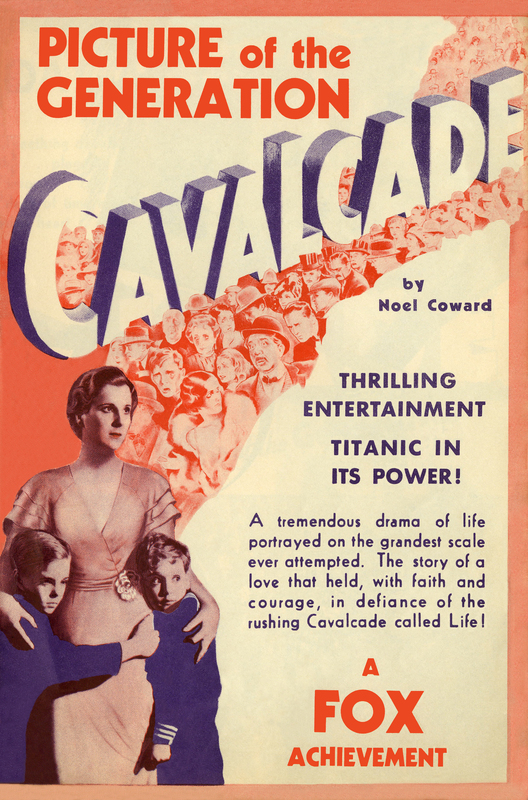 Curiously, on its face, Cavalcade is not particularly interesting: a well-to-do English family faces minor inconveniences among a host of relative stability; their staff, seemingly content but hungry to join an upper echelon, is a normal view on the human experience from a Depression vantage point. It probably projects a more modern experience onto a proto-Victorian, fin de siècle experience than was likely. This movie approaches class almost apathetically, vacating all pretense when the plot simply moves along among tragedy. This approach flattens the movie and rips from it the ability for a modern audience to appreciate its candor and stiff-upper-lip mentality. Cavalcade is quintessentially British, Depression-era, and pre-code. It is also lightly meta. In Cavalcade, director Frank Lloyd demonstrates his understanding of this concept by pitting his aristocratic family against abstract concepts, like love, death, tragedy, and war and following them through the muck, deterred and fazed, but dutiful to the most abstract concept, time. Thirty-four years pass from New Years’ 1899 to New Years 1933 and our family, wealthy but sympathetic, has grieved in great loss of their two sons. The legacy is confirmed by time but time waits for no sorrow like the present. Here this family sits, 34 years after Father Gilbert ships off to South Africa to fight a spectre of an enemy, and Sons Sullivan fights against Titanic’s Iceberg and against global inertia in the Great War. There is a great sense of duty among the Marryots. This movie is well-set-up to predict that the next Great Conflict will end them, heads held high. Only at their end, and with reflection, and balanced on the pinpoint precipice of World War II, does the meta-ness start to show, and with it memorable brilliance. This movie drags as we chase the Marryots through time. Cavalcade also traces the fortunes of a lower-stationed family, the Bridges, as the Marryots’ servants. The entirely self-aware writing releases Cavalcade from established class distinctions by exploring class, not through contempt and narcissism, but through aloofness and standards: the Marryot’s do not disdain the Bridges for their lower standing; they simply do not acknowledge the family at all. This frees Cavalcade to parallel contemporary class issues: duty versus expectation, stoicism versus excitement, Old Money versus Nouveau Riche. The Bridges, too, trudge on and the stakes are somewhat lower, if not more chaotic. They, too, experience death, but the Bridges’ loss is innocuous at best, fatalistic at worse. The lives of Mrs. Bridges and Mrs. Marryot run their course together, linked by circumstance, but nonetheless in formation. The Academy nominated ten films in 1932/1933. Cavalcade‘s lack of distinction among the Best Picture winners is understandable, considering how old it is and how slowly it moves. It simply does not have the recognition or prestige to warrant much attention outside the meta-analysis film historians and geeks. Cavalcade beat movies with name-recognition but little else, too: I Am A Fugitive From a Chain Gang, 42nd Street, and a few book adaptations whose stories have been reworked or remade to middling success: Alcott’s Little Women and Hemingway’s A Farewell To Arms. The word is still out on whether this should have won Best Picture in 1932/1933. This review sort of feels like an extra layer of meta.